Pasta, Prosciutto, and Pea SoupBroth. It’s the foundation for homemade soups that can be table-ready in minutes. And when dinner is sandwiched between school and sports practice or work and a movie, my secret is a shelf lined with big cans of chicken broth. One is just enough to float ingredients for four to six satisfying main-dish portions. 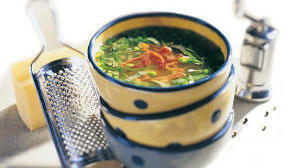 Great soup fixings are often staples lurking in the pantry or disguised as leftovers in the refrigerator. Or I can gather the makings in a quick shop stop. With any of the following soups, all that’s needed for a complete menu is salad, bread, and a simple dessert.